Naughty Boy is British singer, songwriter, producer and musician Shahid Khan, famed for his work with Emeli Sandé, Chipmunk, Wiley, Leona Lewis, JLS, Cheryl Cole, Jennifer Hudson, Alesha Dixon and Tinie Tempah - amongst others. In 2013 Shahid released his debut top 10 album "Hotel Cabana", which featured collaborations with Emeli Sandé, Bastille, Tinie Tempah, Gabrielle, Wretch 32, George the Poet, Ed Sheeran, Sam Smith, Professor Green, Ella Eyre, Mic Righteous, Maiday and Chasing Grace. The album spawned the hits "Wonder" (feat. Emeli Sandé), "La La La" (feat. Sam Smith) and "Lifted" (feat. Emeli Sandé). 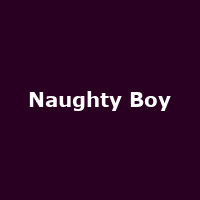 Naughty Boy won two awards at the 2013 MOBO ceremony in the "Best Song" and "Best Video" categories (both for "La La La").